Let’s be honest. Staying productive while travelling is not easy. In fact it’s pretty much the biggest challenge you’ll face if you want to live this lifestyle and spend time in places most people only visit on vacation. The last week has been a good reminder that I, too, need to refocus on productivity. Although I managed to stick to clients’ deadlines, I also had way too much fun going rafting, chilling with friends in a jungle lodge in Ecuador and going mountain biking, making it really hard to keep up with this project. Staying productive can be tough when there are so many new experiences to be had right on your doorstep. I’ve learned a lot within the last three years of my life as a digital nomad however, and would like to share a few important things you need to keep in mind if you want to really enjoy the benefits of working online while travelling the world. In order to stay productive you need to get used to the idea of travelling slow. With so much to experience in each new destination, staying just a few days at every place you visit can make it hard for you to stay focused. If you don’t rush like a backpacker, but really take the time to explore each destination and do what you love in your free time, your time will not only be more enjoyable but you will also spend less money than an ordinary traveller, whilst being almost as productive as if you were working from home. One tip is to set goals to achieve at each destination. Once you have finished them, you are ready to move on and experience another amazing place. One mistake I made in Malawi was that I didn’t arrange a local SIM card and buy local bandwidth in the first big city I went to. As it happened the internet wasn’t too bad at all in Malawi but once the roaming access from our Mozambican SIM was finished we were cut off. Unfortunately most guesthouses don’t have internet in that region either. Even if you don’t plan to work and travel in Africa it’s worth remembering that internet in guesthouses all over the world can be extremely slow. All guests use it at peak times, so having a back-up mobile internet solution is always important when you work and travel. Coworking spaces are springing up all over the world these days. Most big cities mentioned in the Webworktravel Guide have coworking spaces like to welcome visitors from abroad. If you move your office there, you will not only be a lot more productive than working at the beach bar, but you will also meet like-minded people. This is a great way to get in touch with locals and other location-independent travelers. You can easily find your coworking space in global directories like Sharedesk. Not every destination you visit will have a coworking space. That’s why it’s even more important to know how to find good alternatives that will help you to stay productive if the internet in your work place is too slow or the climate too hot. Try to avoid popular cafés with Wi-Fi. Apart from the obvious distractions of your fellow customers, most owners aren’t too excited at having a you spend the whole day in their Café and only consuming a lunch and a few coffees. Furthermore the internet in those places is likely to be pretty slow because you are sharing it with so many customers at the same time. That’s why you should always take some time to walk around in your new location and find a café with friendly welcoming owners, good food and an internet connection on your first day of arrival. If you have major goals or you are getting tired of moving from place to place, take even more time off and make work stops for longer periods of time. These should be in cities where you can rent a desk at coworking space and maybe do a language course or learn something new. After spending more time in those cities you will have a much deeper insight into their daily life and culture. This is one of the biggest and most rewarding advantages for those of us who work and travel, and is something that most tourists will never be able to experience. Travelling brings you into contact with many awesome people from all over the world. One problem is that most of them are on vacation rather than on workation. That said, you will often find that they spend a lot of time browsing the net and feeding their social media addiction, leaving you with plenty of time to get your own work done while they do. However, it is extremely important to learn to sometimes say “No”, and skip an activity or two. Get used to the fact that you can’t join every activity and sometimes need to make your online business a priority – otherwise your trip might last just as long as theirs. 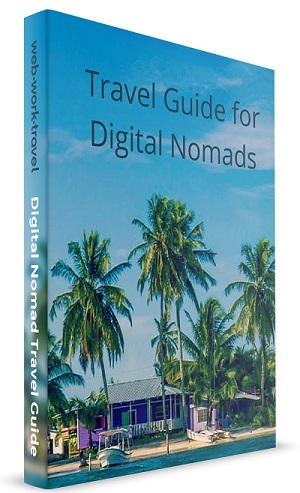 One of the best ways to stay productive while travelling is to travel with other digital nomads. It is a great motivation to be around other people who need to get work done as well, and who understand that this is not just a vacation. And at the same time you can also remind each other to make the most out of your free time. Furthermore you can share skills and ideas, support each other and enjoy all the advantages that you would normally only find in a coworking space. 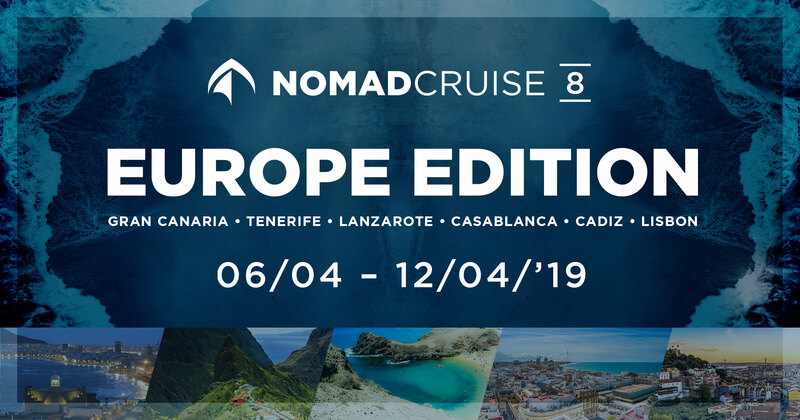 Check out the web•work•travel community to connect to digital nomads with similar travel plans. You’ll be surprised how much work you can get done when you focus on getting the most important things out-of-the-way early in the morning. Most travelers don’t get up early, so you usually won’t be missing out on the action – plus your working environment will be quieter, the internet connection faster due to lower usage and the weather cooler in hot climates. If you develop a good early morning routine of, say, productive work for 3-4 hours and a bit more in the evening, you will still have loads of time for activities in the afternoons. There is an abundance of tools in existence these days that will simplify working with your clients when travelling. Basecamp (for online collaboration) and Teamviewer (for screen sharing) are among the most popular ones. These tools are very easy to use and it makes a lot of sense to get your clients used to them before you start working and travelling. Don’t even mention to them that you plan to work and travel, just convince them to start using these tools due to productivity reasons. Good tools will also help you to minimize client contact, which can be handy if you stay in places where communication can be difficult sometimes. Coming from a cooler region, you may find that working online in countries with extremely hot climates can be something that you just need to get used to. That’s why it can sometimes be a good idea to move to a higher elevation in a mountainous area where the climate is much fresher. You can find beautiful, laid-back destinations that offer a nice change for a week or two in most regions almost anywhere in the world. In fact while writing this I am based in one such destination – Baños in Ecuador. Even though we are so close to the Equator, it’s pleasantly cool here right through the day thanks to the fact that it is 1800 meters above sea level. Waking up every morning with a big hangover will ruin your work and travel trip. This may sound obvious but it is important to mention, as you are likely to be spending some of your time in beautiful destinations where partying feels a part of everyday life. I also think that this is the number one reason many people fail to as digital nomads. But not all travellers throw themselves into that kind of lifestyle, and as tempting as it might be you have to learn to party wisely and not overdo it. If temptation is hard to resist, it might be a good idea to spend more time in destinations where nightlife it isn’t part of the everyday agenda so you can enjoy all the other benefits of working and travelling the world. Some really great tips here! Thanks for sharing. I like the idea of traveling with other people who want to work. In general, life is better when you surround yourself with people who are likeminded and can help you achieve your goals. This includes while traveling – as if you travel with people who aren’t interested in working, it will be harder to leave the group fun to go to other things that need to happen.